There was celebrity and action aplenty at the Irish Cultural Center on Saturday afternoon. A crowd of around 700 hardy souls braved the cold temperatures to see the locals take on New York and the top tier players from Ireland take the field to contest the 2014 All Star game. While the All Stars produced exhibition stuff, the Boston versus New York game got heated as sparks flew in the second half with neither side willing to concede defeat. The inclusion in the proceedings of underage players from the Boston area as well as the Shannon Gaels who traveled from New York made the connection not only between the two cities in the Northeast corner of the United States, but also with the folks at the highest level of the GAA in Ireland who came in numbers. The Boston and Shannon Gaels Under 12 teams got proceedings off to a start. The day started with a Boston Under 12 side facing the national champions, Shannon Gaels from Queens New York. The Boston kids were under pressure for most of the game as the Gaels exhibited some great hand passing skills and broke through for some early scores. Boston generated their share of chances but at the half there was a sizeable gap on the scoreboard. The second half saw the New Yorkers continue their dominance, but Boston had success in putting some scores in their column. Kieran McDevitt (2013 Team) and Mark Dunphy (2014 Team). Goals were the order of the day in the All Star game as the 2013 side came out winners by a score of 5-5 to 9-7. It was a great occasion for two local players who came through the underage ranks, Kieran McDevitt and Mark Dunphy, who got their chance to share the field with the stars. The young Americans were very much involved and fitted into proceedings seamlessly. Rob Hennelley produced some fine saves to earn the man of the match award, while at the other end Bernard Brogan, Sean Kavanagh, and Aidan O’Shea fired home some bullets. 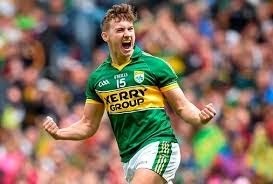 The 2014 side attempted a second half comeback, but despite the efforts of Ryan McHugh and Paddy McBrearty to find the path to goal, the 2013 teams defence, and Hennelly, prevented a comeback with some scrambling rearguard action. 2013 bang in another goal. With the final whistle the youth players who come in numbers stormed the field armed with notebooks, pens, jerseys, and footballs in search of autographs. One enterprising youngster produced a bag with several county jerseys, pulling out the relevant one based on the player doing the signing! Connections were made and restored as folks based on this side of the pond connected with players from their local areas or counties after the game. It is a testament to the association and the players that they make themselves available without question to meet and chat, take photos, and all in the best of spirits. 2013 Team: Rob Hennelly (Mayo), Bernard Brogan (Dublin), Seán Cavanagh (Tyrone), Martin Dunne (Cavan), Lee Keegan (Mayo), Drew Wylie (Monaghan), Aidan O' Shea (Kerry), Michael D. Macauley (Dublin), Colm Boyle (Mayo), Conor McManus (Monaghan), Seamus O' Shea (Mayo), Cian O' Sullivan (Dublin), Donnchadh Walsh (Kerry), Rory O' Carroll (Dublin), Paul Flynn (Dublin), Colin Walshe (Monaghan), James O'Donoghue (Kerry). 2014 Team: Keith Higgins (Mayo), ), Neil Gallagher (Donegal), Paul Murphy (Kerry), Michael Murphy (Donegal), David Moran (Kerry), Cillian O' Connor (Mayo), Paul Durcan (Donegal), Neil McGee (Donegal), Fionn Fitzgerald (Kerry), Ryan McHugh (Donegal), Colin O'Riordan (Tipperary), Shane Walsh (Galway), Paddy McBrearty (Donegal), Tony Kernan (Armagh). The senior football match between Boston and New York really showed the potential for competition between the cities. The game was keenly contested throughout, and on a number of occasions players were cautioned as things heated up down the stretch. Boston started fast and looked like they could take the spoils in the late stages, but New York outscored their opponents four points to one in final few minutes to salvage a draw. An unfortunate episode late in the second half saw Kieran O’Connor, New York’s full back, suffer an ankle injury that will require surgery. The game opened with Cormac Joyce-Power and JJ Matthews trading points. Boston got off to the faster start and moved the ball well and at speed for the opening 10 minutes as the forward line looked lively. Noel Graham added to the lead, while a penalty following a pick-up in the square was deftly put away by Robert Croft. Gary Brilly at center back had drawn the assignment of marking Longford man, Matthews, and was a leading light in Boston’s efforts. Brilly’s anticipation and follow through when challenging for the ball was an example to his side. A Matthews goal following a solo run through the heart of Boston’s defence settled the visiting side and the New Yorkers proceeded in putting the Boston back line under heavy pressure. Boston defended well, and at times appeared to have an extra defender to help close down attacks as New York deployed the sweeper system. Corner forward Colm McGinn who dropped back to shore up the defence left Niall Gallen to shield the corner backs on the Boston side. At this stage options were scarce for Boston to move the ball past their own half forward line as it was all hands to the pump in defence. New York’s half back line held what looked like a perimeter that their opponents could not breach. Brian Connor, formerly of the Connemara Gaels, converted a free and Mike Hallissey stole forward for a point to put the visitors into the lead heading into half time. Truth be told, the gap between the teams could have been more were it not for a fine save from Connolly who tipped a ball heading for the corner around the post. Some wayward shooting from New York did not help their cause, and a rare Boston move into the opposing half saw Croft level the scores just before the break and make it 1-3 each. The second half saw New York pick off two early points, Gary O’Driscoll and a Connor free, before Paddy Coakley was called upon to pull off a save from close range prevent a goal. Boston found their groove as the half progressed and tallied five points on the trot. Ian Whelan drew Boston level, and Dan McCabe put a well worked effort over the bar that began with his Wolfe Tones clubman Gary Brilly in the back line. McCabe pointed again and Croft put two frees over the bar to see Boston into a three point lead as the hosts who had looked tired, found life with about 15 minutes left. Things had been getting testy with referee Tadhg Lucey issuing yellow cards to try and maintain order amid flare ups on and off the ball, a few of the players wearing the result of the skirmishes after the game. With the end in sight and the game looking like it was headed in favour of the hosts, New York lifted themselves and drove forward. With the push on to restore parity, Connor put another free over the bar, and shaved the top of the crossbar shortly afterwards to reduce the gap to one. Ian Whelan won a couple of key midfield balls to relieve the pressure on his side. Joe Fitzpatrick put Boston back into a two point lead, and almost restored it to the three only to see his effort drop just short. A lengthy stoppage ensued as Kieran O’Connor suffered a bad ankle injury when in possession. After play resumed points from Ciaran Hughes and Matthews brought the teams level before the whistle for time sounded. Boston: Eoin Connolly, Niall Gallen, Damien Doolan, Sean Doherty, Mike O’Brien, Gary Brilly, Sean Conneeley, Ian Whelan, Sean Moriarty, Joe Fitzpatrick, Noel Graham, Coleman Mulkerrins, Dan McCabe, Cormac Joyce-Power, Robert Croft. Subs: Matt Smyth, Paddy Coakley, Gareth O’Neill. New York: Gavin Joyce, Ronan McGinley, Kieran O’Connor, Ger McCartan, Keith Scally, Mike Hallissey, Keith Quinn, Brian Connor, MJ Fitzgerald, Keith O’Connor, JJ Matthews, Ross Wherity, Luke Loughlin, Gary O’Driscoll, Colm McGinley. Subs: Richie Morgan, Ciaran Hughes. The All Stars are almost here! Next Saturday is shaping up to be a day not to miss for GAA fans and supporters in the Northeastern United States. The Boston Northeast Division and the Irish Cultural Center are hosting a traveling party of 100 from Ireland, including GAA and GPA dignitaries, referees, media, and of course a star studded group of 30 of the top Gaelic footballers in the world who will play on the storied turf at the ICC in Canton. The ICC and Boston GAA have hosted All Star hurlers and footballers shortly after the facility opened in 1999, and since then, to great success, the Martin Donnelly Interprovincial football and hurling finals. President Liam O’Neill, and President elect Aogain O’Fearghaill, will be making the trip, as will GPA President, Dermot Early. The delegation arrives on Thursday, and there will be a series of events, including a reception with the Consul General, before the big day on Saturday. Jim Gavin, Dublin manager, will be taking care of the 2013 All Star team, while Mayo’s James Horan will manage the 2014 selection. 2013 and 2014 players of the year, Dublin’s Michael Darragh McCauley and Kerry’s James O’Donoghue are part of the trip, as is 2014 young player of the year, Donegal’s Ryan McHugh. The underage players in the region will have the exciting opportunity to train with the All Stars on the morning of the game. At 9:30 the players will hold a camp for the underage players in the region, what a chance for a young kid to learn from the best players there are! All underage players are welcome to participate. The Boston Gaelic Football panel received a visit from Mikey Harte during their preparations. Not only will folks be journeying across the Atlantic, a sizeable contingent of adult and underage players will be heading up Interstate 95 from New York to participate in the historic proceedings. 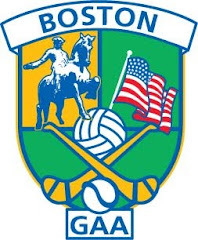 A Boston selection will play New York’s Shannon Gaels in a U12 challenge game to get the action rolling at 11:00. Then it is the turn of the Boston and New York senior players at 12:00. The local home based players seldom have the opportunity to play together and have jumped at this chance. For New York, entrants to the Connacht Senior Football Championship each year, this is an opportunity to play against North American based opposition. While the game is billed as a challenge, Boston versus New York in any sport is seldom that, neither team will want to come out on the losing end of this one. Boston U12s will face the National Champions, Shannon Gaels of New York. So, plenty to look forward to as the two biggest GAA cities in North America come together with the best of the best from Ireland. Boston Squad: Eoin Connolly ( Connemara Gaels) , Paddy Coakley (Mc Anespies) , Colin Mc Carron (Donegal) , Sean Doherty (Donegal) , Shane Kelly (Shannon Blues) , Damien Doolin (Connemara Gaels) , David Clifford (Shannon Blues) , Sean Connelly (Connemara Gaels) , Garry Brilly (Wolfe Tones) , Pat McNicholas(Connemara Gaels) , Conor Mullen (Shannon Blues) , Niall Gallen (Mc Anespies) , Paudie Kenneally (Christophers) , Collie Donnelly (McAnespies) , Pat Murray (Shannon Blues) , Ian Whelan (Kerry) , Noel Graham (Connemara Gaels) , Matt Smith (Donegal) , Gareth O’Neill (Mc Anespies) , Mike O’Brien (Wolfe Tones), Coleman Mulkerins (Connemara Gaels) , Cormac Joyce-Power (Wolfe Tones) , Robbie Croft (Kerry) , Conor Fitzgerald (Shannon Blues) , Ciaran Mc Devitt (Donegal) , Sean Moriarty (Shannon Blues) , Joey Fitzpatrick (Kerry) , Dan Kenneally (Christophers) , Dan McCabe (Wolfe Tones) , Shane Kavanagh (Shannon Blues) , Joe O’Shea (Kerry) , Mark Dunphy (Donegal). New York Squad: Gavin Joyce (Cavan), Ger McCartan (Kerry), Kieran O’Connor (Kerry), Ronan McGinley (Cavan), Keith Scally (Westmeath), Anthony Sweeney (Kerry), Lee Kelly , (Rockland), Mike Jim Fitzgerald (Kerry), Brian Connor (Leitrim), Keith O’Connor (Cork), Colm Maginn (Cavan), Seán Dalton (Cavan), JJ Mathews (Longford), Gary O’Driscoll (Kerry), Luke Loughlin (Westmeath), Jer O’Sullivan (Kerry), Tommy Warburton (Cavan), Richey Morgan (Armagh), Michael Hallissey (Armagh), Liam Deane (Barnabas), Shane Hogan (Barnabas), Ciarán Hughes (Leitrim), Mickey Leneghan (Cork), Ross Wherity (Kerry), Damian McCaughey (Manhattan Gaels), Seán Liddy (Armagh), Keith Quinn (Leitrim), Seán O’Neill (Cork), Jason Kelly (Offaly), Ciarán Brennan (Leitrim), Eoin Ward (Cavan), Dermot Mullen (Cork). The Irish Cultural Center is located off Route 138 in Canton Mass. Take Rte 138 South off I93/Rte128. After 2 sets of lights, turn right on New Boston Drive and drive straight into the car park. Check out www.bostongaa.com or www.irishculture.org or follow us on Facebook, Boston Northeast GAA.